I'm not a quitter, son. And so I read and reviewed the rest of this series, and hated every goddamn minute of it. It was a serious grind to get through. So enjoy my pain and let's do this! Okay? We clear on the disclaimers? Let's finish this thing! America gets in touch with her roots, as her grandmother explains the origins of their home planet, her people, how they came to the Utopian Parallel, and the history of her mothers. Basically, this issue is ANOTHER origin story for America. I guess her original "cultural assimilation" origin wasn't QUITE as "Woke" as the writer thought it should be. So NOW it's revealed that America's REAL planet of origin (or at least her mother and grandmother's) is the hilariously named Planeta Fuertona. . .$hitty Spanglish for "Strong Woman". And yeah. . .it was inhabited entirely by Hispanic Alien Women. It's ALSO revealed that the "Utopian Parallel" where America was actually born is also (SURPRISE!) inhabited entirely by Hispanic Female Aliens, and was created as sort of an inter-dimensional women's shelter by Wiccan (AKA The Demiurge). AND we get a look at the "Ancestral Plane", which is inhabited by (Yep. . .you guessed it) hispanic female alien world-building spirits. In other words, this is pretty much poorly-written lesbian fan fiction more suitable for Tumblr than a release by a major publisher. Fortunately, the art FINALLY steps up to the plate for some pretty impressive panels in this issue, especially toward the front of the issue when America visits the Ancestral Plane. But then again, there's a lot of artists for a single issue (6 pencillers credited! ), so there SHOULD be at least a few good moments to be found. Overall, despite some impressive art (finally!) this issue is nothing more than lesbian fan fiction wish fulfillment where the entire galaxy seems to be inhabited by Hispanic Lesbian Aliens. No friggin' wonder this series only lasted a year before going down in flames. WELL, AT LEAST THE ART IS LOOKING BETTER, SO THERE'S THAT. America returns to Sotomayor University, her favorite teacher is kidnapped by Extermanatrix, the school comes under attack by Midas Corporation's "Mindless Ones", which the new University Administrator uses as an excuse to tighten security on campus. The new administrator tries to bribe America's friend into spying on her, and then takes America into custody for breaking curfew. It's revealed that the new admin is actually Exterminatrix in disguise. As you can see from the description above, there's a return to the "jumping from place to place and plot to plot" that made the first few issues more than a bit hard to read. There's a LOT going on here. It's pretty obvious that the writer knew about the upcoming cancellation of the series and was trying to stuff as much as she could into the final few issues. It's really a mess. . .and to tell the truth, you can almost SEE the desperation on the page. 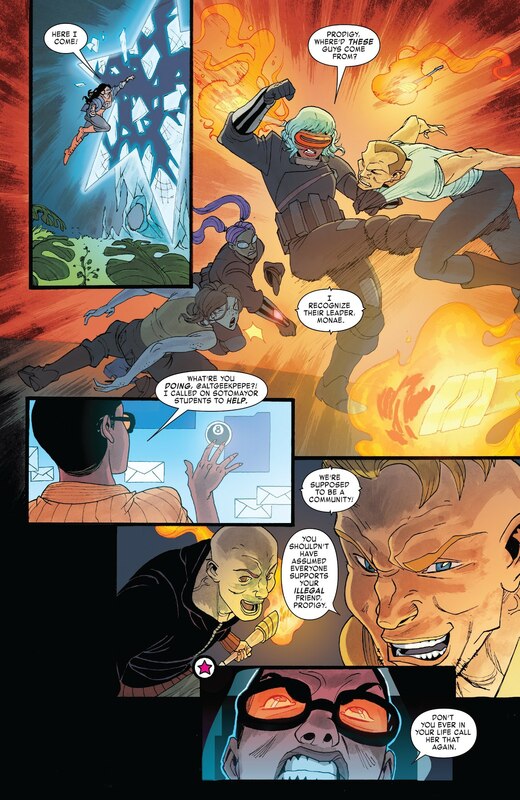 Overall, this issue is an overstuffed, undercooked can of plot threads spiced with hilariously heavy-handed far left political views of "The Police State invading educational Safe Spaces" that are dripping with obvious desperation to get a message out while the writer still has a platform. Sonya Sotomayor became a Supreme Court Judge in 2009. So in order for 3 generations to have gone to Sotomayor University, this story would have to take place in roughly 2045. But I guess this writer's obsession with "Ancestral Power" is mightier than her ability to do research. . .and math. 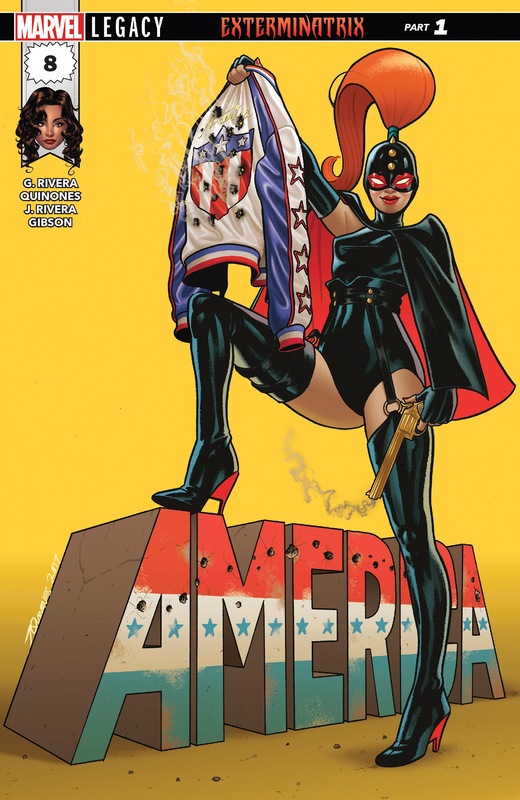 America is taken prisoner by Exterminatrix as part of a vague plan to conquer the multiverse using an army of America-themed cyborgs. It's up to a ragtag army of America's allies to rescue her and save Sotomayor University. This is just. . .embarrassing. It's basically a "FIGHT THE POWER!" message delivered by an army of Hispanic Lesbians (and Prodigy. . .who is pretty much South Park's Token in this book as the only "good" male character in this series) VS. an evil White Woman and her faceless minions. The art on this issue is wildly inconsistent. . .veering from "Pretty Damn Good" to "What The F*CK?" panel to panel. There's only one artist credited, but it looks like a couple actually worked on this issue. Overall, this a a laughable mess trying desperately to deliver a message in all the wrong ways. AN ARMY OF ROBOT "AMERICAS"? NICE JAB AT "THE EVIL WHITE PEOPLE WANT US TO CONFORM", BUT REALLY? THIS IS THE MASTER PLAN? The final battle against Exterminatrix, her army of America-themed cyborgs, and her evil white men allies comes to a finish as America's motley band of Hispanic women (and one token black dude) fight "The Power" until America is done gathering her strength on the ancestral plane and joins them for the final victory. Afterwards, America decides to leave college and return to her ancestral home of Planeta Fuertona. At this point, the plot no longer even matters. . .that is, if it ever REALLY did. All that matters now is to cram as many of the writer's ideological messages into the few remaining issues as possible. And so we get (from the top): Chosen family having your back, gaining power from ancestral knowledge, fighting against corporate greed, standing up to the "Alt-Right" (via kicks to the nuts, of course), protecting safe spaces, and recognizing the power within yourself (to kick white people in the nuts). It's pretty much a hot mess with a mixed bag of artwork ranging from "decent" to "crap" as the cherry on top of this rotten propaganda leaflet disguised as a comic book sundae. I don't even want to read the last two issues. But I will. After all, I'm a white guy and therefore I MUST be punished. . . THIS ONE SINGLE PAGE IS A PRETTY DECENT SUMMARY OF WHAT THE BACK HALF OF MARVEL'S AMERICA IS REALLY ALL ABOUT. 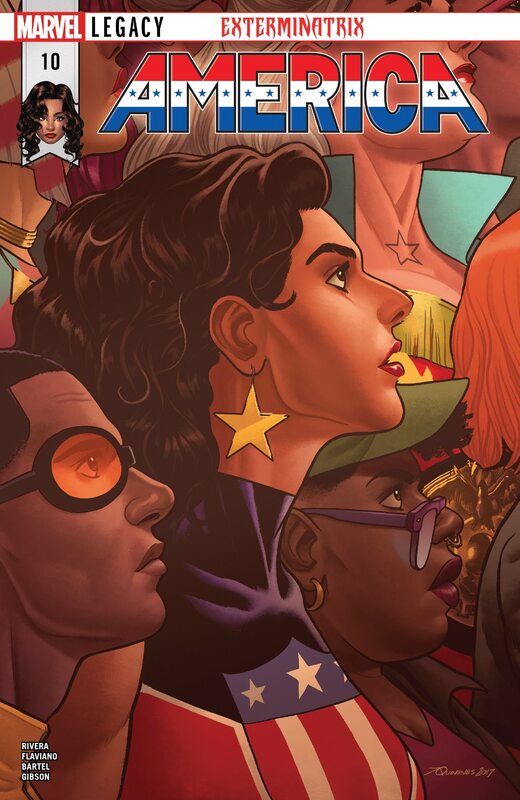 . .
After making sure that Sotomayor University is safe from evil white people, America returns to the planet her people abandoned. . .only to run into a bunch of other hispanic females with superpowers. She communes with a giant crystal that lets her know that she's the super-est of all the super-duper female hispanics there and F*ck this. I can't even finish this nonsense "Story" recap. . .none of it matters beyond providing a framework for all the propaganda messages. This issue is practically unreadable by anyone not thoroughly indoctrinated to the writer's ideology by now. The ultra-feminist/ lesbian/ Hispanic racial superiority messages break against my brain like waves on the shore of madness. Thank God there's only one more issue to go. MUST. . .GATHER. . .ANCESTRAL. . .STRENGTH! TOKEN. . .ER. . .PRODIGY GETS TO HAVE A FINAL ANGRY MONOLOGUE AGAINST THE EVIL WHITE PEOPLE. COMPLETELY OUT OF CHARACTER, BUT WHY STOP THE NONSENSE NOW? 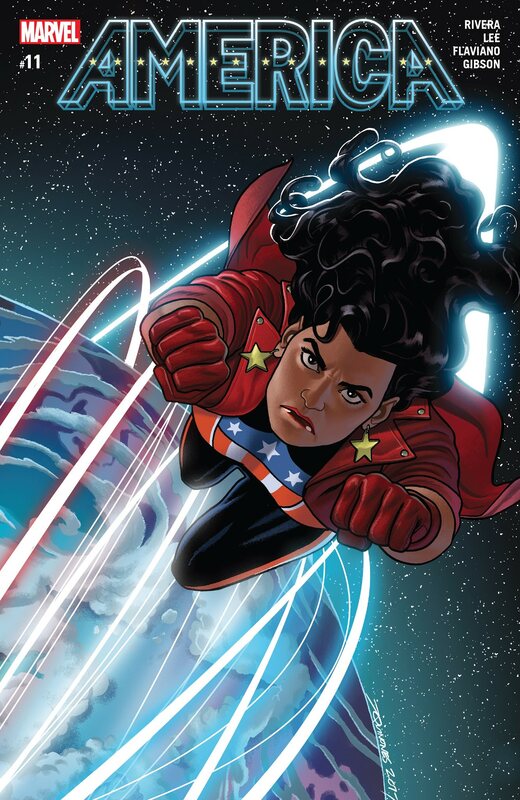 OH, LOOK. . .THE WORLD THAT AMERICA'S ANCESTORS ABANDONED IS ACTUALLY FULL OF HISPANIC FEMALE SUPERHEROES. WHAT A FRIGGIN' SURPRISE! 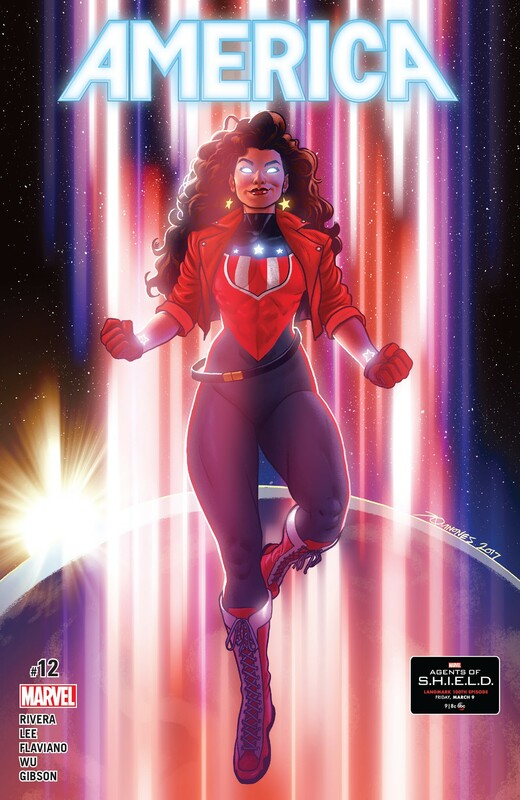 In the first half of my review of America, I laid the blame for this propaganda dumpster fire squarely in the lap of Marvel's hiring someone who had never even READ a comic book based soley on her gender, race, and sexual identity. But on consideration, I realize that Marvel shouldn't shoulder ALL the blame for this. There's definitely more to go around. And no. . .I'm STILL not blaming Gabby Rivera for this fiasco disguised as a comic book. She was given a platform and she ran with it. This series was obviously written from the heart, and you can feel Rivera's passion for what whe was doing. I may have personal objections to her hateful opinions and extreme racial superiority views. . .but this is America and she has the right to voice her $hitty opinions, the same way I have the right to voice my own $hitty opinion of her clunky, amateurish writing. So I'm not going to get personal with Rivera. Like I said, she was given a platform out of the blue and she used it to the best of her ability for as long as she could. So if not Gabby Rivera this time. . .then who? While researching the reasons for the existence of this monthly identity politics propaganda pamphlet, I noticed a HUGE disparity between "professional" critic reviews and reader reviews. This is best illustrated by Comicbook Roundup where the average critic rating is 7.8, while the reader rating is a dismal 2.6. America garnered GLOWING reviews from the first issue to the last. I maintain that these reviews are dishonest, and (to be completely frank) purposely misleading. I've read many of them and they are SO in love with the IDEA of America being a "needed representation" that they completely ignore the actual nuts and bolts of QUALITY in favor of gushing about the "Heart" and "Emotion" behind the comic. They word their "reviews" in such a way to hide the fact that EVERY GODDAMN ISSUE FROM FIRST TO LAST is sloppy. . .with giant plot holes, amateurish writing, and art that veers wildly from "pretty good' to "WHAT THE F*CK IS THIS?" It makes me sick when I read these misleading reviews. These "professionals" are SUPPOSED to be telling us if something is worth spending our money on. They're NOT supposed to be shills for ideology and propaganda disguised as a goddamn comic book series. I don't give a flying $hit about the "heart' of a comic. . .WILL THE FRIGGIN' PICTURES MAKE MY EYES BLEED OR NOT? Comic books are turning into an expensive hobby. We're paying about 4 bucks a pop for new comics these days. What I DON'T need is someone writing glowing reviews for a comic because they don't want a vocal minority accusing them of being racist, or homophobic, or misogynistic. . .OR because they want to promote a certain political point of view or ideology that they think needs promoted. Treating "diverse" material differently than everything else. . .using kid gloves and praising what SHOULD be getting slammed is NOT progress. It's pandering, it's dishonest, and it's not good for the comic industry or its readership. So yeah. . .I place the rest of the blame on dishonest reviews. Without their pandering, glowing testimonials to how awesome America was, it probably would have lasted to a 6 issue trade finish. 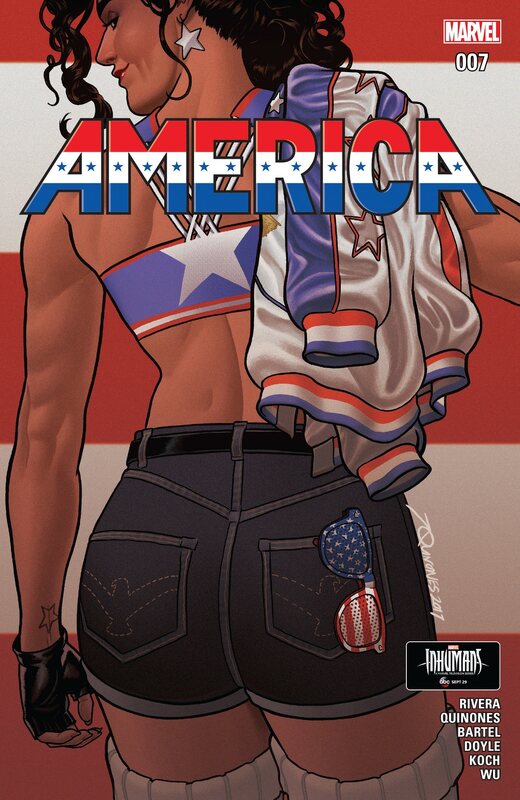 Overall, despite glowing reviews, America is one of the worst comic series I've ever read. It's basically a skeletal framework to hang the writer's extreme political and racial opinions on, backed up by wildly inconsistent art. See, "professionals"? How hard was that? Just tell the goddamn truth. Not exactly sure, but God I hope it's good. I think maybe Alien Vs. Predator: Eternal. Picked up all 4 issues from a dollar box this past weekend and haven't read it yet.